This technology provides a noninvasive method to visualize the coronary arteries using a small dose of contrast. You will be referred out for this test to a radiology lab. The new 64-slice multidetector CT scanner allows providers to analyze coronary artery lesions as well as blockages that were previously impossible to visualize. CT gathers multiple images, which acquires great amount of diagnostic information in a shorter amount of time. Unlike traditional x-ray imaging that produces a 2-D projection, CT takes thin x-ray scans from multiple directions. These multiple scans can be combined to create a 3-D image or volume. 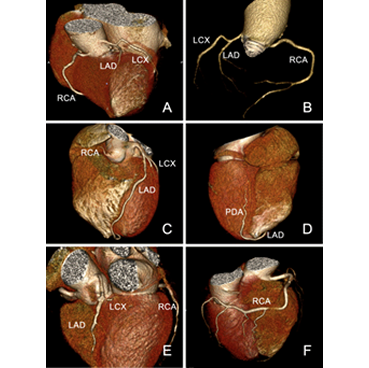 CT is used for 3-D volume imaging of the heart. For coronary CTA, a recent blood test for kidney functions and a ordering form is required for this test. Patients with kidney malfunction, asthma, diabetes, allergies to x-ray contrast, irregular heart rhythms or a pacemaker or implantable defibrillator will be given further individual evaluation and special instructions. To obtain high quality images with CTA many individuals require administration of a beta-blocker prior to the test to keep their heart rates under 70 beats per minute. What is the difference between CT angiography and traditional coronary angiography? How much radiation do I get from a Calcium Score or Coronary CTA? How do I prepare for a Calcium Score or Coronary CTA scan? What can I expect during the scan? How long will my CT exam take? CT angiography (CTA) is a noninvasive heart-imaging test that can determine the extent of narrowing in the coronary arteries. Traditional invasive coronary angiography, also known as cardiac catheterization, uses a catheter inserted into an artery in the upper thigh and threaded up to the coronary arteries to inject x-ray dye and make two dimensional x-ray movies of the coronary arteries. CTA is a non invasive diagnostic scan that uses x-rays and intravenous x-ray dye to create 3-D images of the coronary arteries on a computer screen. Although CT is an x-ray technique, the amount of x-rays used is minimized by advanced detector and computer technology to achieve the best image quality at the lowest possible radiation dose. The radiation exposure for a calcium score is equivalent to a one-way coast-to-coast airline flight. The exposure for a CTA is less than exposure to a Thalium Stress Test. Calcium score CT requires no special preparation. For coronary CTA, a recent blood test for kidney function, EKG and responses to a screening form must be obtained prior to scheduling. Patients with kidney malfunction, asthma, diabetes, allergies to x-ray contrast, irregular heart rhythms or a pacemaker or implantable defibrillator will be given further individualized evaluation and special instructions. To obtain high quality images with CTA many individuals require administration of a beta-blocker prior to the test to keep their heart rates under 70 beats per minute. During a CT scan, you will be lying on a comfortable couch as it slowly moves through an opening in the examination unit, commonly referred to as the ‘gantry.’ All you have to do is follow the instructions given by the CT technologist or radiologist. For example, you may be asked to briefly hold your breath or not to move certain regions of your body. CT itself is a quick, painless procedure. For CTA, an IV is required for injection of x-ray contrast (dye). of an IV and an hour of observation after the test, so plan to spend approximately two-and-one-half hours.